The subatomic particles that make up the atoms that make up ALL MATTER, including you and I, and infused with KINETIC ENERGY! That means that the subatomic particles are in constant motion. 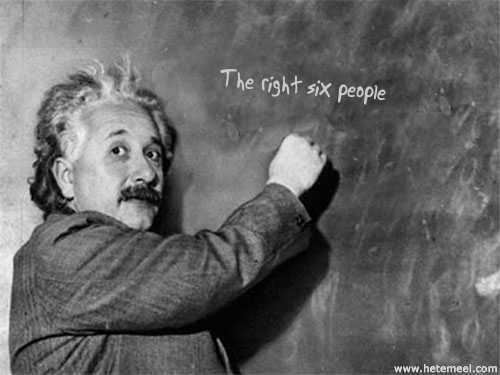 Einstein's famous equation is so simple, yet totally profound! Einstein's simple equation not only quantified the relationship between energy and mass, but he even showed that energy and mass were, in fact, simply 2 forms of the same thing! Einstein speaking about the equation E = mc2 (211kB, .MP3 file) From the soundtrack of the film Atomic Physics. Copyright © J. Arthur Rank Organisation, Ltd., 1948. The electrostatic repulsion that exists between the outer negatively-charged electrons of one object or person and another object or person, prevent atoms from being able to "pass through" one another. Even on a small scale, individual atoms can't "pass through" each other either. At best, a chemical reaction can occur and a chemical bond may form from an interaction between the outermost electrons of each atom. Before we talk about osmosis, we must first understand diffusion. The word diffusion comes from the Latin word for "spreads out". In nature, molecule will behave in such a way to "spread out" from an area of high concentration to an area of low concentration, until a time in which those concentration become equal. At this state, the substance is said to be at equilibrium. it is this phenomenon that is responsible for the air currents and ocean currents, as well as the diffusion of a substance in liquid. 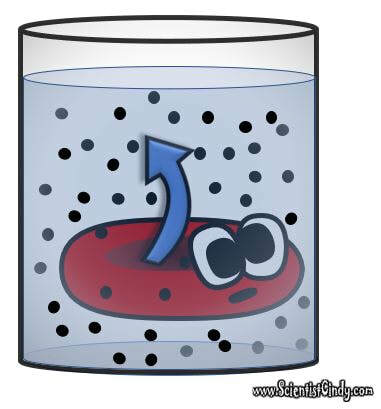 Since our cells are in an aqueous environment, we will be looking at this type of diffusion. Gasses and liquids behave this way because their atoms are always in motion. This motion is called "Brownian motion". Brownian motion causes molecules to collide with each other which makes them spread out to maximize their area to move in.They want some"elbow room"! 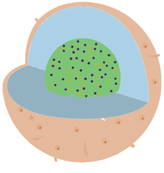 This is an illustration of a cross section of the cell membrane. ​ Cell membranes are semipermeable. This means that only certain substances are allowed to travel through the cell membrane. The structure of the cell membrane creates a barrier between the extracellular environmental and the intracellular environment. This property is due to the chemical properties of the phospholipids that make up the cell membrane. 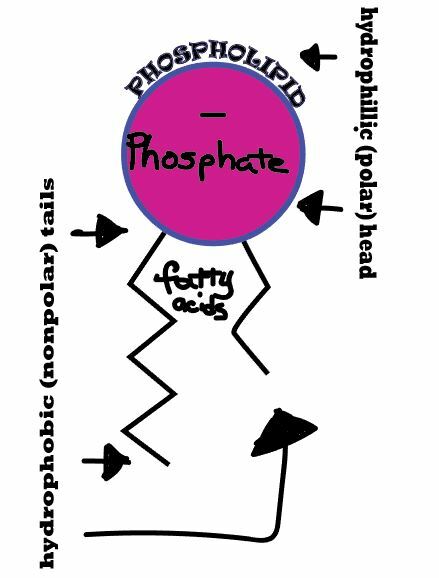 The phospholipids are called amphiphilic, ​because they have a hydrophilic (water-loving) head and hydrophobic (water-fearing) tails. When phospholipids are placed in water, they spontaneously form a lipid bilayer. 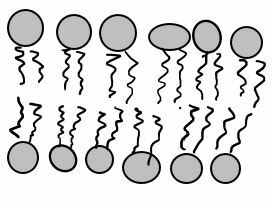 In this phospholipid bilayer, the fatty acid hydrophobic tails will orient themselves to face one another with the hydrophillic phosphate heads facing outward toward the aqueous environments. This structure allows the membrane to be selectively permeable. Diffusion occurs because molecules and atoms are always in motion. ​ Before we talk about osmosis, we must first understand diffusion. The word diffusion comes from the Latin word for "spreads out". In nature, molecule will behave in such a way to "spread out" from an area of high concentration to an area of low concentration, until a time in which those concentration become equal. At this state, the substance is said to be at equilibrium. it is this phenomenon that is responsible for the air currents and ocean currents, as well as the diffusion of a substance in liquid. Since our cells are in an aqueous environment, we will be looking at this type of diffusion. 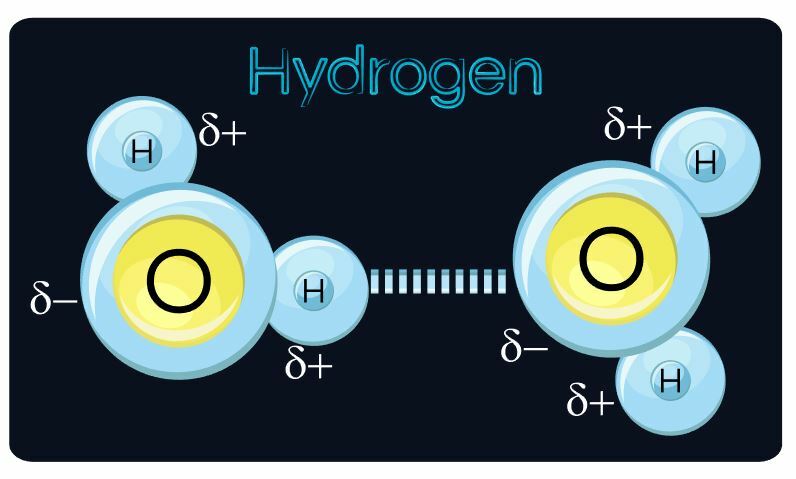 Gasses and liquids behave this way because their atoms are always in motion. This motion is called "Brownian motion". Brownian motion causes molecules to collide with each other which makes them spread out to maximize their area to move in. They want some"elbow room"! ​ EXAMPLE: Let's say it is a hot summer day and some kids are enjoying themselves at the local pool. A kid at one end of the pool decides to urinate (pee) into one end of the pool. Initially, the pee will be concentrated at the end of the pool where the pee landed. After some time, that pee will then spread out evenly over the volume of that pool reaching the unsuspecting pool-dwellers at the far end of the pool. This is because in diffusion, liquids (or gasses) flow from an area of high concentration to an area of low concentration, until an equilibrium (no difference in concentration) is achieved. In other words, the pee is equally distributed everywhere. BUT.... The cell membrane is semi-permeable. So not all substances are able to freely diffuse across the membrane. ​ When this occurs, we see that substances that can freely diffuse, like water, behave differently. When water diffuses in this manner, it is referred to as OSMOSIS! In osmosis, we only concern ourselves with the movement of water molecules (H2O) across the cell membrane. As we saw in diffusion, molecules will travel from an area of high concentration to an area of low concentration. ​To understand this concept, it is important to think about a solution in terms of its components. Then we can define solutions in terms of the concentration of solute and define how cells will be effected by exposure to those solutions! We can define solutions in this way as being.. In biological systems, the solute in unable to freely diffuse across the cell membrane, so it builds up a ​concentration gradient. 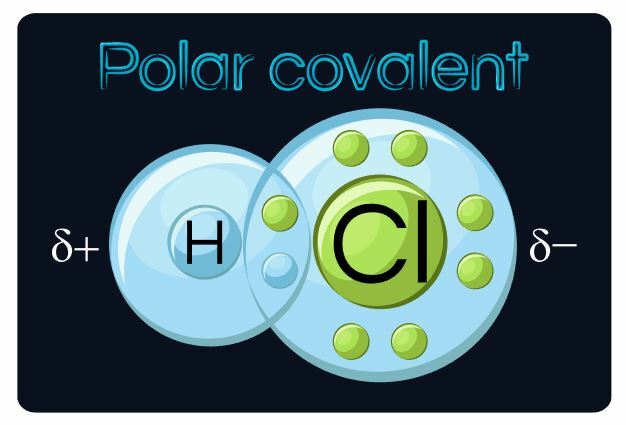 ​This means that there is a higher concentration of solute on one side of the membrane than there is on the other. A hypotonic ​ solution is one that has "less" concentration of solute to solvent than the intracellular fluid (fluid inside of the cell). When a cell is placed in a hypotonic solution, water rushed INTO the cell and causes it to SWELL or BURST. ​ ​A hypertonic ​solution is one that contains a higher concentration of solute to solvent than the fluid inside of the cell. When a cell is placed in a hypertonic solution, water will rush out of the cell, causing it to shrink.